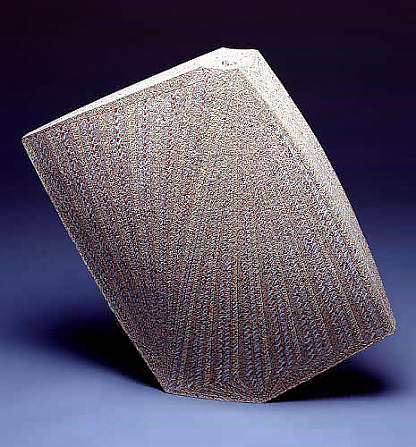 Kishi Eiko is a contemporary Japanese ceramist, well known for her Saiseki-zogan works. 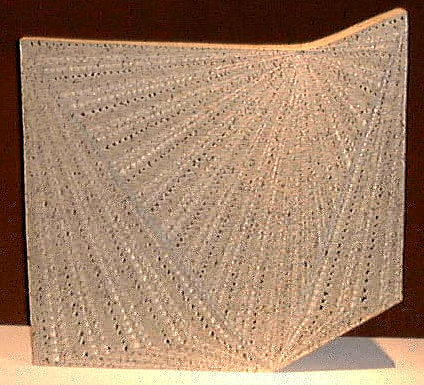 Incredibly delicate patterns appear as almost stitched into the clay. The forms range from large geometric walls to smaller oval-and-hexagonal-covered vessels. Kishi's saiseki-zogan process involves mixing colored pigments into the Shigaraki clay and then forming it into her desired shape. 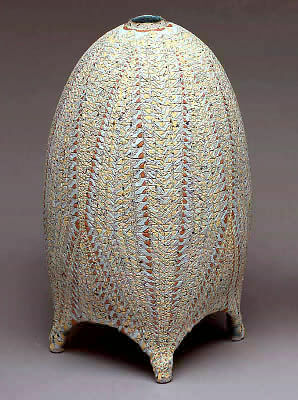 Then a design is etched out with a very hard needle and pigments, and clay or glazes are then applied again. The results are outstanding with yellows, reds, greens, blues and whites weaving around the works in fanciful colored bands.